I'm a little late with this Thanksgiving recipe. I decided to volunteer to make sweet potatoes for our Thanksgiving friends potluck this year. Last year, one of our Southern friends volunteered to make it. It was this horrible mashed sweet potato casserole thing topped with marshmallows. I don't understand how people eat sweet potatoes like that... I always grew up having chunky sweet potatoes, so this year I knew I wanted to volunteer to make potatoes the way I wanted to eat them. This recipe is still a little too sweet for me, but it's good. It smells boozy but doesn't taste too much like whiskey. Cut potatoes and toss with salt, pepper and a little oil. Roast at 400 degrees for 20 minutes or until cooked about halfway. Remove from oven. In a separate saucepan, melt butter with molasses and brown sugar until dissolved. Add bourbon and cook to burn off the alcohol. Simmer for 5 minutes or until slightly thickened. Pour potatoes into a baking dish and pour sauce over the top. Bake at 400 for another 20 minutes or until the potatoes are nicely glazed. 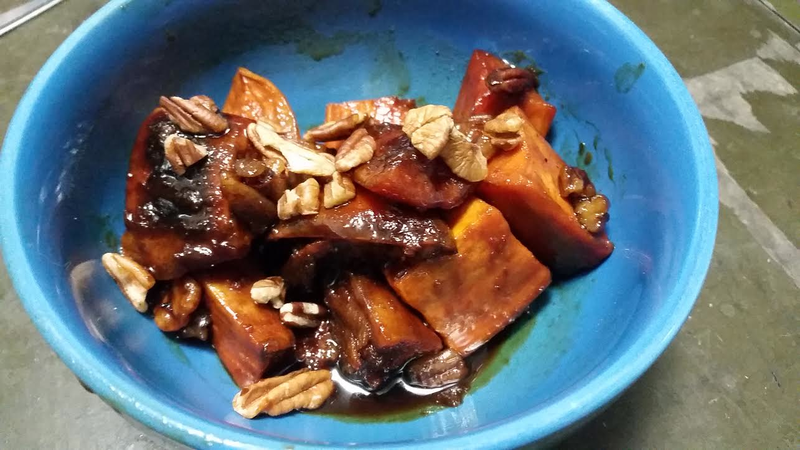 Top with toasted pecans and serve. Thanks for stopping by. I couldn't resist checking out this recipe! You had me at bourbon. Or sweet potatoes. I always thought I didn't like sweet potatoes because they were always so sweet. Now I absolutely love them, but I prefer them with just some butter and salt & pepper - or just a bit of sweet. I know you said this is still a bit too sweet, but I think I'm going to have to try it anyway. Pinned for later.